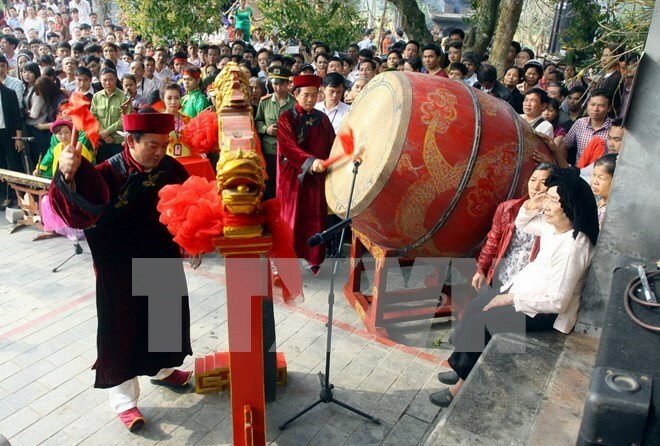 Phu Tho (VNA) – A festival dedicated to the nation’s legendary mother Au Co kicked off in Ha Hoa district, the northern province of Phu Tho, on February 14, the 7 th day of the Lunar New Year. The festival marked the start of many festive activities in the locality. It was opened with an offering ritual to the guardian deity at the local communal house. A palanquin procession began later in the day, taking the offerings from the communal house to the Au Co Temple. The three-day festival offers visitors a chance to take part in folk games, and enjoy arts performance. Legend has it that Au Co, a fairy and the daughter of De Lai, descended to earth on this day. Later, she met with Lac Long Quan and gave birth to 100 sons. Fifty of them followed their father to the sea and the other half followed their mother to the mountains. When the family arrived at Hien Luong commune, mother Au Co and her children were so captivated by the area’s fertility and stunning landscapes that they decided to settle there, and this was where the eldest son was crowned as Hung King. They practised water rice cultivation to provide food, planted mulberry trees, and bred silk worms before Au Co returned to heaven on the 25th day of the twelfth lunar month.